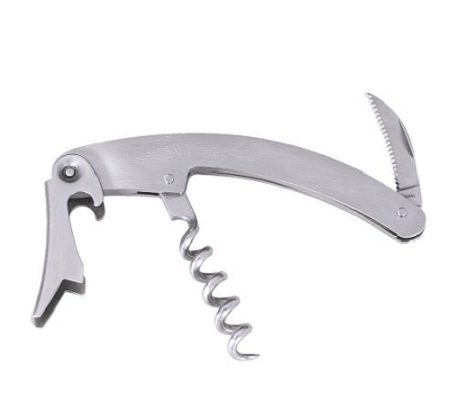 A wine key is a corkscrew used to open wine. It is sometimes called a waiter’s friend or a sommelier knife. It’s similar in design to a pocketknife and feature a folding corkscrew and a small blade for cutting the foil around the top of the bottle. There are better corkscrews out there, but wine keys are the most practical, transportable, and handy. Any decent waiter, bartender, Frenchman, or alcoholic has one. Everybody should have one really, especially if you drink wine. You don’t want to be stuck drinking Franzia forever.